Simple Leave Application Letter Format for any reason or without reason. Short leave application for students, teachers, marriage, office, workers and employees. I beg to say that I was absent for two days from 23rd to 24th -June XXXX. I hereby request to accept my leave as I was not feeling well and was hospitalized. 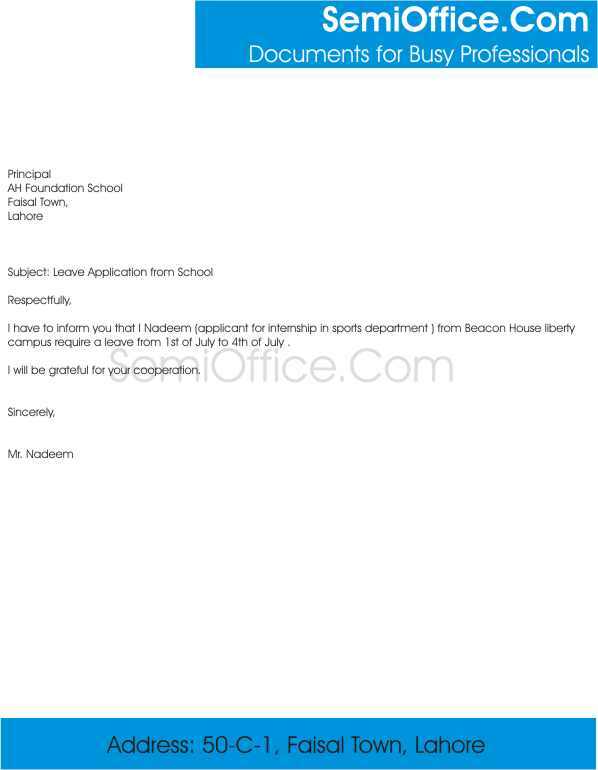 I have to inform you that I Nadeem (applicant for internship in sports department ) from Beacon House liberty campus require a leave from 1st of July to 4th of July . I will be grateful for your cooperation. It is to inform you that I cannot attend the school for three days on account of illness. The doctor has advised me to take complete bed rest for three days. You are requested to grant me leave for three days dated from Oct, 4th to 6th I shall be grateful to you for this favor. I have an urgent work to do at home and i am unable to come to the school. Kindly grant me a leave for one day. I shall be thankful to you.